During the mid-90s, Blaine Bishop was one of the best strong safeties in the NFL. While his interceptions didn’t show it, he certainly made up for it with his ability to enforce at the line of scrimmage and nose for the ball in the box. Blaine was drafted in the 8th and final round of the 1993 draft. A surprisingly deep draft, 6 players drafted in Round 8 made the ProBowl in their careers- more than any other round in that draft except for Round 1 (7) or Round 2 (also 6). Bishop was to provide depth for talented Houston Oilers secondary that already included Cris Dishman, Darryll Lewis, Mike Dumas, Steve Jackson, Marcus Robertson, Bo Orlando, and Bubba McDowell. Bishop beat out former second round pick Mike Dumas and join the Oilers roster that season starting 2 games for the team. As the team imploded in 1994 with the implementation of the salary cap, Coach Jack Pardee resigned under fire. Defensive coordinator Jeff Fisher took over, and Bishop saw a more important role in the defense starting 13 games that season. 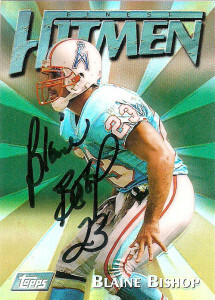 From 1995-1997 Blaine earned 3 Pro Bowl appearances, and joined the team when it commuted to Tennessee in 1997. He’d earn another Pro Bowl appearance in 2000, but an injury shortened 2001 ended any hopes of a repeat. In 2002, Blaine played one final season with the Philadelphia Eagles. Blaine, as of 2015, lives in the Nashville area where he does radio and sports commentary. 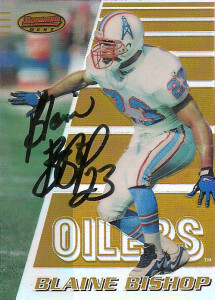 One of the last connections to the Houston Oilers, I had been looking for a few cards for sometime that represented Blaine. Topps really upped their game with foil quality cards and the Hitmen series in the mid-90s have been some of my favorites from their collection.